This an easy to make salad with crunchy noodles. Healthy, as it contains so many veggies in it. Kids also love this because it is a colourful salad. In this salad you can use veggies of your choice like like, Beansprouts, Sweet corn, tomatoes also. Can be prepared easily in minutes as the cooking time of veggies are less. Healthy tasty crunchy Salad. You can make this for parties, Kids lunch box. It suits all occasions. I have used different coloured capsicum. You can prepare this with simple green capsicum too. There will not any taste difference. Heat water in a pan and boil the noodles until soft. For me it took about a minute or two. Drain the whole water and rinse with Cold water and keep aside. Meanwhile heat oil in a pan to smoking hot and fry the drained noodles till crispy. Drain the noodles from oil and keep aside. Heat oil in a pan and add the onion and cook for fifteen seconds then add the ginger and cook for further fifteen seconds. Add the three coloured capsicum and stir well; add some salt and sugar and cook for fifteen seconds. Now add carrot and beans and cook for further fifteen seconds. Add the cabbage and cook for fifteen seconds. Now add soya sauce,vinegar, chilli powder, pepper powder, tomato sauce in the pan at a same place. Using spatula mix chilli powder slightly into the sauce and then mix and allow to coat the sauce into the veggies and cook for another fifteen seconds. Add the spring onion and mix well. Now check for salt. Add if salt or sugar if required. Now switch of the gas and add the crunchy fried noodles and toss well. Serve more fried noodles and spring onion on top. Noodles salad looks absolutely tempting !! Fantastic, i can finish that plate of crunchy noodles salad rite now even after having my dinner, soo irresistible. This looks amazing Lincy :-) Making me hungry! colourful & crunchy salad..looks so yummy..
Looks very inviting and delicious!! This platter of salad looks irresistible. the way you have cut the veggies..lovely. N no wrds fr ur presentation.. so clorful n tempting salad..
What a riot of colors! Lovely! Want this bowl right now, wonderful and absolutely delicious dish. such a coloful clicks lincy ...look so yummy . crunchy salad...amazing presentation..beautiful clicks...happy to follow u. 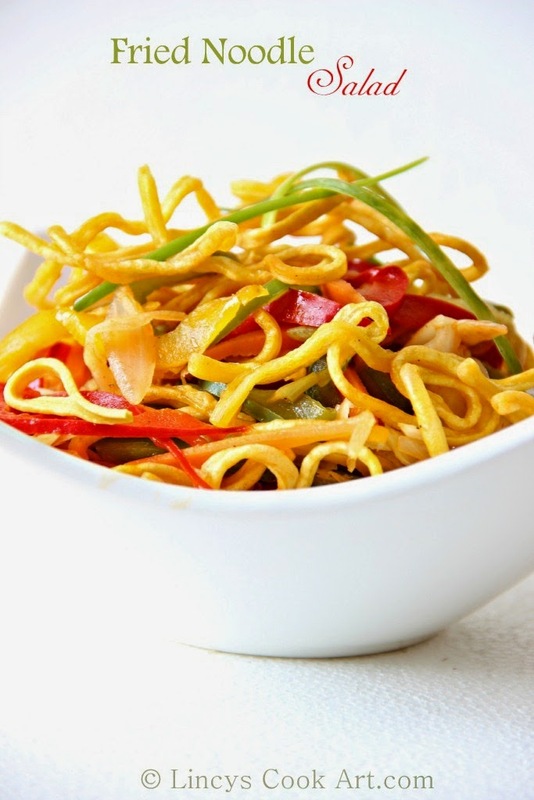 Fried noodle salad looks delicious and colorful very nice clicks.